We’d love your help. Let us know what’s wrong with this preview of Shattered by Sharon M. Johnston. Ryde Mishca needs to save her sisters, but only Ryder can save her. In the interests of full disclosure, I was part of the book launch for Shattered at the start of the month; Sharon is also part of the Aussie Owned and Read blogging team that I'm a part of. I originally read the first book in the series when it was published under another name by a different small press; it had a not-quite-cliffhanger-y ending, and I had to wait for years for the sequel. (Not quite a GRRM number of years, mind you, but still an inconvenient amount of time!) I was delighted to se In the interests of full disclosure, I was part of the book launch for Shattered at the start of the month; Sharon is also part of the Aussie Owned and Read blogging team that I'm a part of. I originally read the first book in the series when it was published under another name by a different small press; it had a not-quite-cliffhanger-y ending, and I had to wait for years for the sequel. (Not quite a GRRM number of years, mind you, but still an inconvenient amount of time!) I was delighted to see that Shattered picked up where Divided left off; Mischa, having discovered the truth about her origins and a threat to her previously unknown sisters, is determined to save them. There’s a fair amount of action in Shattered, and quite a few different supernatural factions at play. At first I had categorised the series as modern-day sci-fi, but in hindsight it’s more of a mash-up between that and urban fantasy. The nature of the different supernaturals would be a spoiler (and in one case a guess, as it hasn’t been revealed), but it’s a really interesting combination. I’m looking forward to learning more about the reasons for it in the third book. Ryder and Mischa make an adorable couple, and I was glad to see that whole pesky “Colin” complication take a back seat in Shattered — though I expect Colin is less pleased about the situation! Each of the pair has comic-book-style “origin story” issues as a result of being adopted as babies, which gives them something to bond over and makes their lives more than a little freaky. The only reason this isn’t a five-star read for me (and I say this with much love for Sharon) is that I feel like her press has let her down in the final copy edit department. There were a few grammatical errors that made me twitch. To my mind, if a press is taking a cut of the profit, they should do a better job at weeding those out — the author can’t really do it because they are too close to their own work to see them! Gah! This is the second book in the Open Heart Novel series. And it is great! This book picked up where the first one left off. Mishca is hunting for her clone sisters and trying to beat the evil clone sister that is trying to find them and kill them. Mishca wants to save them. There is a lot of things in this book that makes you guessing what happens next wrongly. This book is very well written and I can't wait until the 3rd one comes out!! I was given a copy of this book in exchange for an honest re This is the second book in the Open Heart Novel series. And it is great! This book picked up where the first one left off. Mishca is hunting for her clone sisters and trying to beat the evil clone sister that is trying to find them and kill them. Mishca wants to save them. There is a lot of things in this book that makes you guessing what happens next wrongly. This book is very well written and I can't wait until the 3rd one comes out!! Recommends it for: anyone who likes sci-fi. 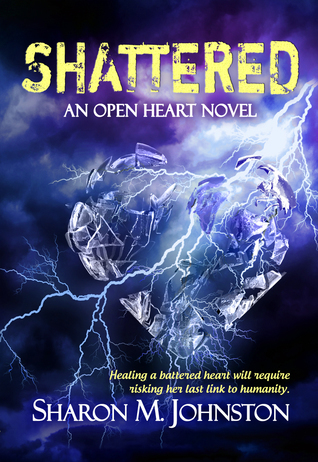 Shattered is the second book in the Open Heart series by Sharon M. Johnston. I really enjoyed the first book in the series (Divided) and couldn’t wait to get my hands on the sequel. In this book the main character, Misha, is on a quest to find and rescue them before their evil twin kills them. A quest that by no means is as easy as I might sound. During this time we also get to follow Misha and her relationship with Ryder in more detail since half of the book is written from Ryder’s point of view Shattered is the second book in the Open Heart series by Sharon M. Johnston. I really enjoyed the first book in the series (Divided) and couldn’t wait to get my hands on the sequel. In this book the main character, Misha, is on a quest to find and rescue them before their evil twin kills them. A quest that by no means is as easy as I might sound. During this time we also get to follow Misha and her relationship with Ryder in more detail since half of the book is written from Ryder’s point of view. After reading Shattered I do wish I had read the first book again before starting the sequel. I found myself feeling a bit lost and I didn’t recognize the characters even though this book basically picks up right where the first one ends. I do think it would have been much different had I read Divided again. The book is very well written, and just like Divided, this book is full of surprises and twists. You can never guess what will happen next and I love it. I did struggle a bit with keeping Misha’s and Ryder’s POV apart. The dual POV also made the story lack a bit of depth and I kept wishing I’d been given more intel to Misha’s inner thoughts and feeling. It became a bit shallow at times. But still, a great book with such a different plot and the twists and turns this book send the reader on is amazing. Shattered by Sharon M. Johnston is a romance set in Australia! I was so excited to read it, travelling to Australia is definitely on my bucketlist and there aren't enough books set there. I haven't read the first one in the series, it wasn't hard to learn my way around Mishca's world but I do want to go back and read the first one. Mishca was an awesome heroine and Ryder, who I was a little hesitant to like because of his name (a lot of romance heroes have that name and I was ready to write him off when I read the blurb for Shattered) pleasantly suprised me! He was a great match to Mishca! I really enjoyed the blend of genres. There was romance with the use of dual POV's for the protagonist and her beau, the little bit of science fiction sprinkled in and the suspense. The twists and turns in Shattered kept me glued to my kindle. Just wow. Book 2 has knocked my socks off. After finishing book 1 Divided I immediately picked up book two to find out what was going to happen with Mischa and Ryder. Listen not disappointed where the story took off. Mrs. Johnston has done a wonderful job creating a world of realism, with experimentation into the scientific and mythological realm. You can't help but get caught up in the things that this girl is trying to accomplish while trying to stay alive and to protect others. Looking at Rider Just wow. Book 2 has knocked my socks off. After finishing book 1 Divided I immediately picked up book two to find out what was going to happen with Mischa and Ryder. You can't help but get caught up in the things that this girl is trying to accomplish while trying to stay alive and to protect others. Looking at Rider trying to come to terms with his past and finding out his future is going to be a whole lot different than he expects but he still won't have all the answers. So not good at waiting and it will be 2017 before book 3 gets published I don't like waiting I need to find out what's going to happen to this group of people next sooner. I read the first book forever ago, so I'd had a long time to speculate on where this story was going to go. Nope. I was so wrong. Total surprise. I have to say, I liked Mishca more in the first book, but she comes around later in the story--just takes a little bit. The reasoning behind the arms-length, then hold-me-close off-and-on relationship felt a little flimsy to me, but okay. If you say so. Ryder became my favorite through this book. What a great guy! And oh my goodne Did not see that coming. I have to say, I liked Mishca more in the first book, but she comes around later in the story--just takes a little bit. The reasoning behind the arms-length, then hold-me-close off-and-on relationship felt a little flimsy to me, but okay. If you say so. Ryder became my favorite through this book. What a great guy! And oh my goodness, his history... Whew! Now that was epic. Totally unexpected. "Shattered" is an adventure diving into the psyches of two enhanced youth dealing with dramatic changes in their lives, and has the potential to be an outstanding suspense read but first, it is imperative that the reader realizes this is not a stand-alone novel. This second book in the series keeps the action going and the romance between Mischa and Ryder continues to be complicated. The author has really created some great characters. Mischa wants to protect those she loves even if it puts her at great risk. Ryder is such a good person and a really good match for her. You really root for them to be together. It leave you eager for the third book to be released.